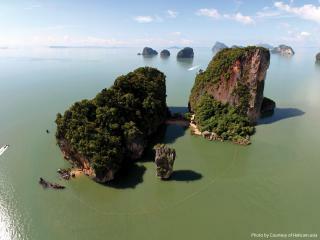 In 2002 Phang Nga Bay Marine National Park was added to the Ramsar List of Wetlands of International Importance. The 42 limestone monoliths punctuating the bay's shallow turbid waters not only act as a natural base to a rich variety of documented flora and fauna, including over 28 species of mangrove, 88 birds, 82 fish, 18 reptiles, 3 amphibians and 17 mammals, they also provide secure overnight anchorage and offer exhilarating adventures of discovery for their visitors! By far the most rewarding way to experience the awe-inspiring magnificence of the Phang Nga Bay's geography is to take to the water and explore the bay under sail. 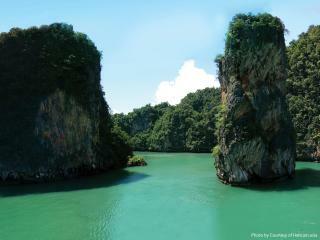 If you have the budget, private sailing yacht charters with experienced and knowledgeable crew can be booked on Phuket. By proving your sailing skills and experience, 'bareboat' charters are also possible. If you wish to learn sailing, there are several schools on Phuket that schedule internationally recognised tuition around the bay, including Phuket's RYA certified training school, the Phuket Yacht Club and for smaller craft, Phuket Youth Sailing Club. Anchoring up for the night isn't really a problem as there are plenty of sheltered moorings to go round and the shallow waters commanding the northern apex of the bay allow safe dropping of the anchor virtually anywhere! Many of the islands, islets and rocky knolls harbour collapsed sea caves or, as they are called locally, 'Hongs' of varying sizes and - although too small for yachts to access - are ideally suited for canoe, kayak or dinghy. The Hongs can be obscured from view so take time to scan the craggy surfaces on the waterline, paying particular attention to anything that resembles an opening. Once inside, you may well find all manner of wildlife either on the limestone walls or in the elevated jungle above, winding caverns to explore, some even with secluded beaches and sheltered lagoons - ideal for a private picnic and a spot of swimming or snorkelling - whatever you discover you will be away from the crowds! 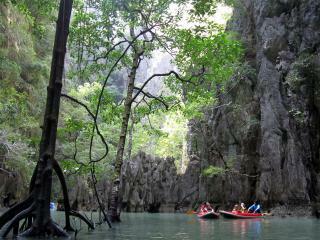 It's also possible to explore the bay by joining a sea canoe excursion. Single or multi day tours can be booked at most beach resorts and are a great option if you want to get up close and personal with nature, support boats follow along and carry any additional supplies and basic amenities such as toilets and eating facilities, leaving guests free of having to carry any excess baggage. Aside from being the setting in numerous Hollywood blockbusters, Phang Nga Bay was well and truly placed under the spotlight back in the mid-1970s with the filming of the James Bond movie 'The Man with the Golden Gun'which quickly catapulted the tiny island of Koh Phing Kan, along with its now iconic nail-shaped offshore pinnacle, Khao Tapu, into a 'must visit' destination on Thailand's tourist map. 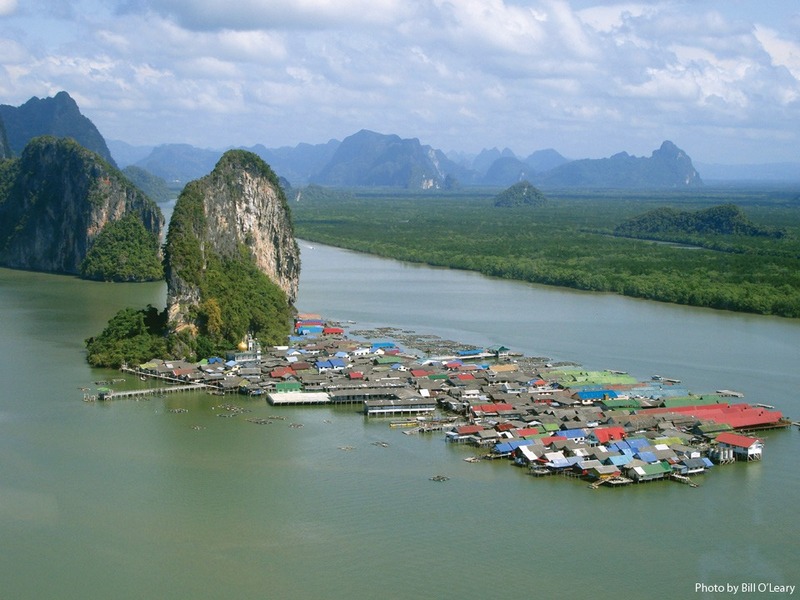 The pair of islands is now endearingly known as 'James Bond Island' and they are more commonly referred to under this collective name. Daily visitations can climb into the thousands! To avoid the crowds, plan your trip before 10:30 in the morning or in the late afternoon, when most of the day trippers are absent. Longtail boats can be hired privately from Phang Nga - it will also cost you a 200 Baht landing fee, levied by the Park Rangers. Overshadowed by a single limestone karst, the nearby island of Koh Pan Yi, also known as the 'floating village' is literally jam-packed with an assortment of rickety dwellings supported by a handful of restaurants and shops, a school and a mosque, all precariously constructed on stilts over the ocean to keep them, and the island's seemingly out of place internet service, high and dry above the shallows below. Nowadays the majority of the 1,500 islanders, originally fishermen utilising birds of prey to secure their daily catch, involve themselves in some way or another in the tourist industry, either on the island or by making the daily pilgrimage to Koh Phing Kan to tend to stalls selling snacks and souvenirs to visitors. The fishing birds continue to earn their keep, but as photographic models on stalls also selling tourist bric-a-brac that line the edges of narrow walkways on Koh Pan Yi, which provide the way to get around the island and - just like the buildings they divide - the prices are also elevated! The recommended way to reach Phang Nga is to travel via Phuket or Krabi International Airport. 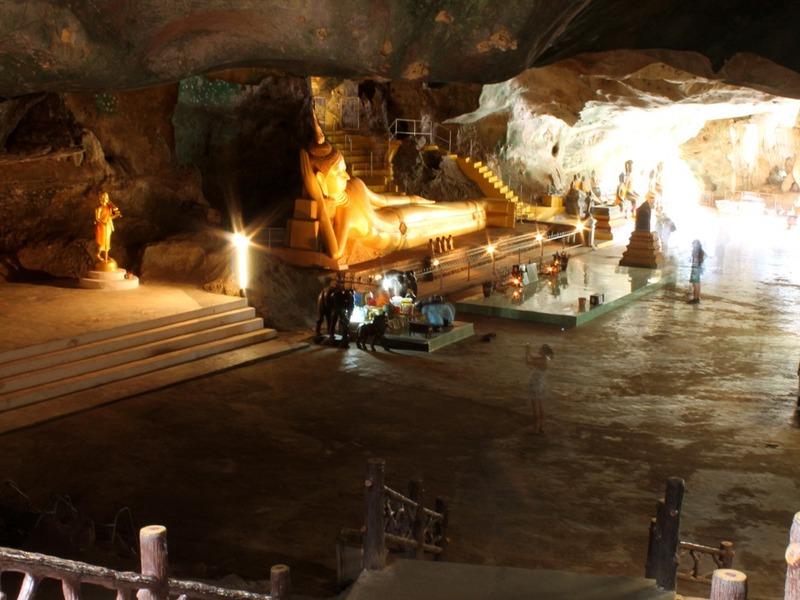 Phang Nga Bay is approximately a 45 minute road journey from Phuket and Khao Lakand around 90 minutes from Krabi, by private car or by joining one of the many daily organised bus tours to 'James Bond Island' from either destination. 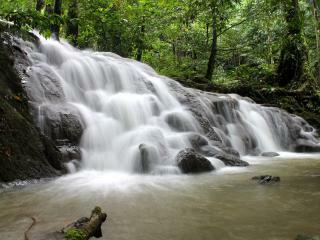 Included in the day-long excursion is lunch on Koh Pan Yi which is directly en route from Phang Nga. 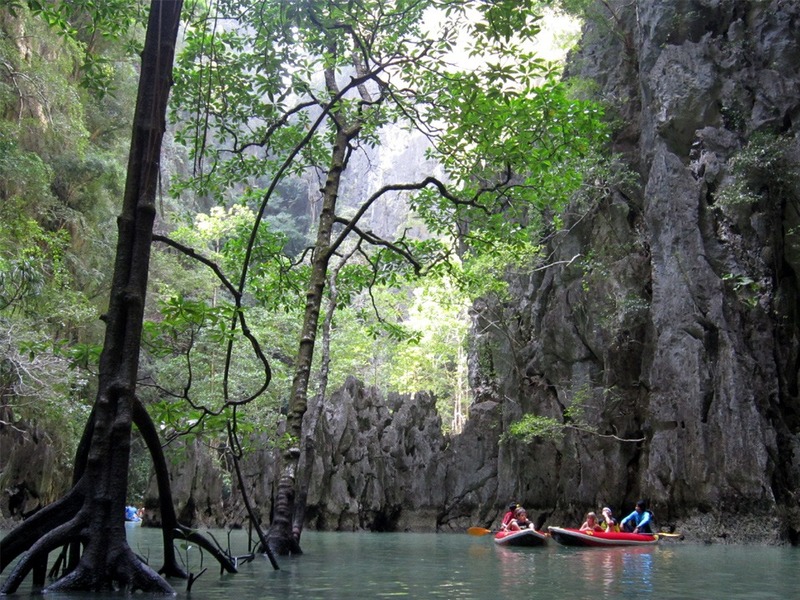 Speedboat tours follow a similar itinerary and depart daily from Phuket during the high season. 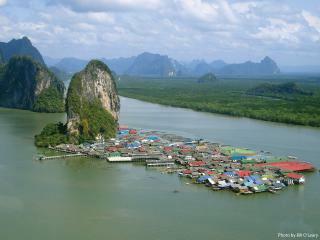 Alternatively, you can charter a longtail or speed boat from Phang Nga to the island. Sailing yachts can be chartered on the island and are a great way to explore Phang Nga Bay at your own pace, complemented by an abundance of opportunities to explore all the glorious islands and beaches en-route, which would have otherwise been passed by! And of course, you take your accommodation with you so there's no additional cost for hotel rooms. One thing to remember is that, as some of the area is Marine National Park, there is an entry fee of 200 Baht per boat per day, plus 200 Baht per passenger, and it is collected on the spot.